Driveways have a functional purpose but, if planned properly, can be a decorative feature that compliments your home’s design. They can also make a dramatic first impression while boosting curb appeal, which we know also raises the value of your home. If you have an old poured concrete driveway that needs replacement or are lucky enough to start one from scratch, we have tips for designing and installing an awesome way to arrive home. Properties with large front yards often provide more opportunity to get creative with design but any driveway is an opportunity to make a stunning statement. First, it’s important to figure out how cars will get from the street to the garage and what kind of permitting and/or covenant rules need to be followed. Will you need to park cars there? How many? Will other cars need to pass parked cars? Do you need space for a turn-around? How much street parking is currently available? Do you want the cars to drive in a complete circle without returning to the street? A driveway’s terrain will also influence design. Boulders and trees will need to be avoided and sloping needs to be considered. Plenty of driveways have been laid on slopes but consider hiring a home improvement expert who can make sure the sloping is such that it doesn’t cause bumper damage to cars and is safe for all vehicles to navigate (plus, you may need a permit). A good rule of thumb to use is that it shouldn’t slope by more than 15 feet up or down for every 100 feet of driveway. Smaller homes or those with modern design may look best with a simple, straight driveway. However, estates may require something more grand and ornate with curves and detail. But the shapes below are the most common for modern driveways. 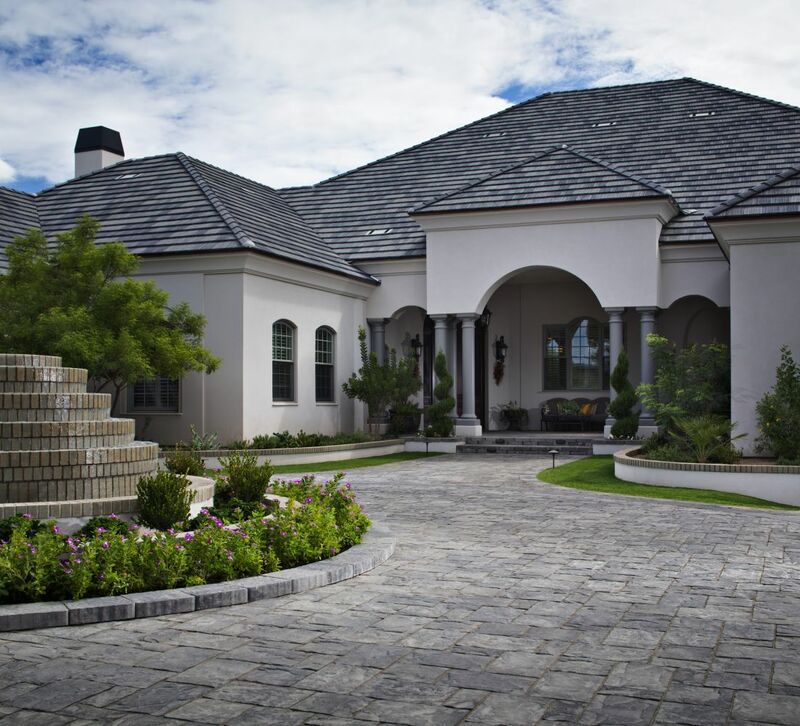 Also called horseshoe driveways, circular driveways are some of the most popular shapes for homes with ample lots. Cars can basically drive in, pass the front door of the home and drive back to the street without every turning around or backing out. Driveways in this shape might also be particularly important to homes on busy streets where backing out might be a hazard. The most frequent reason for installing a curved driveway is because the garage doesn’t line up with the access point from street but it could also be because of something you’re trying to avoid, like a tree, or because you’d like a larger driveway to prevent parking a car on the street. Driveways that curve too tightly can be difficult for cars to maneuver in and out of. And, the curve will need to angle in a manner that allows drivers to navigate in and out in one go without needing to stop and reverse, for example. 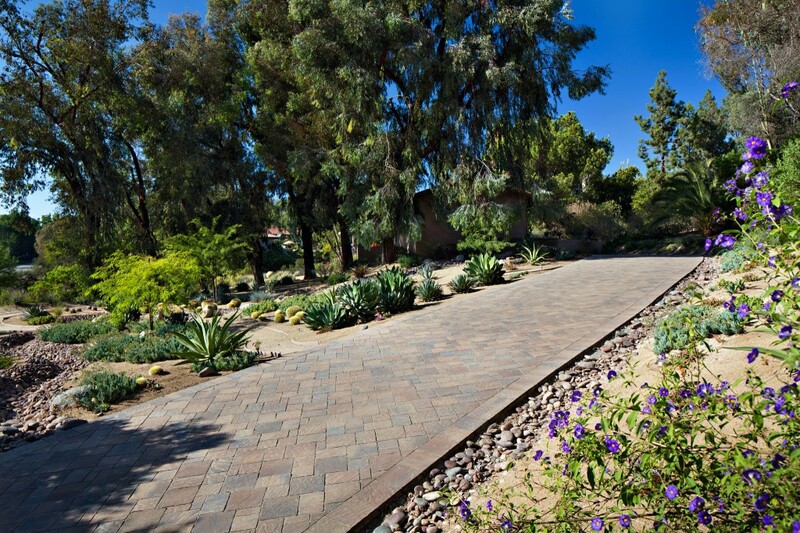 Experts agree that curved and circular driveways tend to add more character to a house. And as the owner of a curved driveway, it’s important that the curve be easy enough to navigate without much thought. In a rush to get the kids to school, for example, it’s easy to turn too late even after over a decade of driving the thing multiple times per day. When a garage faces the street and is directly lined up with the curb apron entry from the street, a straight driveway is the best (and sometimes the only) option. But even larger estates may opt for a straight driveway which provides a nice line of vision that directs focus to the front of the home, especially if lined by trees. Another consideration when it comes to driveway design is making sure that water can adequately divert into gutters or storm drains. After deciding the shape, next comes selection of materials. A number of people default to poured concrete or asphalt without completely understanding the wide variety of colors, shapes and sizes are available when it comes to concrete pavers. Sure concrete can be colored and stamped to resemble pavers, but there are benefits to installing the real deal. With fault lines and manmade hillsides, it’s common for the ground in Southern California to shift which causes concrete slabs to crack. Installing pavers eliminates this risk plus if oil drips or some other kind of irreparable stain occurs, pavers can be popped out and replaced individually. Maintenance on pavers is typically also lower than poured concrete and asphalt. There are even options that look like natural stone without having to deal with the constant sealing and flaking. 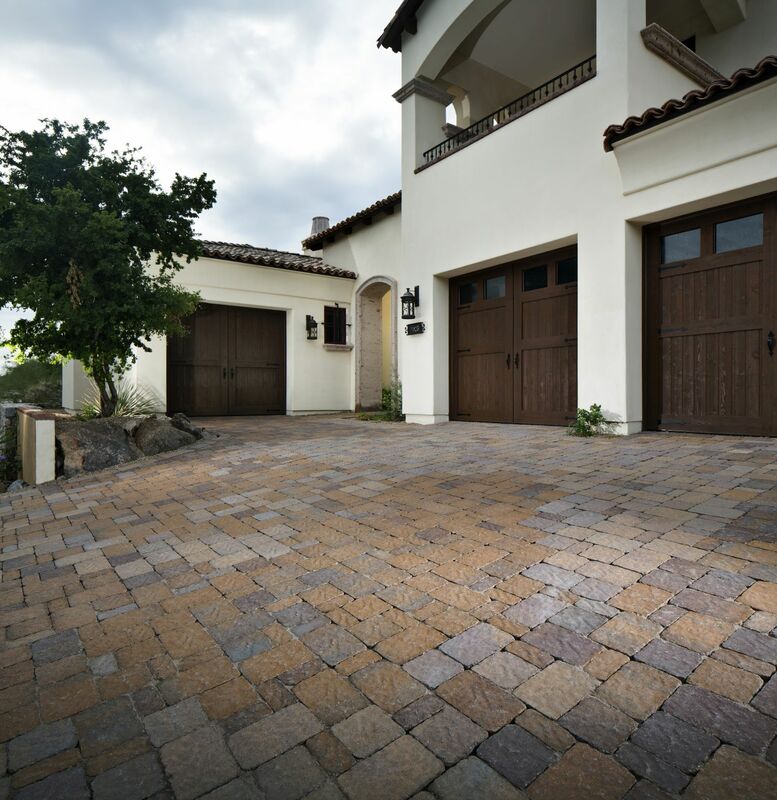 It’s also possible to mix and match color and types of concrete pavers to create decorative borders and patterns within a driveway or patio space. Those needing an extra punch of green can consider Turfstone pavers that allow grass or even gravel between them. A professional installer can help you narrow down combination options. Even after the paving material is installed, it’s possible to jazz up your driveway further in multiple ways. If the driveway is wide enough, container plants add extra punch. Circular driveways can also revolve around focal points such as a built-in planter or fountain (both which happen to be easy to build using pavers). If your driveway is curved, container plants aren’t the best idea as if the driver fails to execute the turn properly, containers can tip over or even cause damage to the car. Trust me on this one. Gates are another important aspect to any size of home for security reasons and can be designed to compliment your home as well as remotely open and close. As always, it’s incredibly important to check permit requirements when it comes to your driveway. Creating or moving a driveway apron requires a permit in most cases because it’s considered city property. Otherwise, the City of San Diego does not require a permit for driveways that are 30″ or lower below grade. Are you considering a new driveway?